He is known for his bulky frame, impressive presence in his team's defense and his strength of character to become the leader on the field which separates him from many other great goalkeepers. Oliver Kahn biography shows him winning eight German Championships, Six German Cups, UEFA Cup in 1996, UEFA Champions League and the Intercontinental Cup (both in 2001). His presence on the field earned him four consecutive UEFA Best European Gaolkeeper awards, Two German Footballer of the Year awards and three IFFHS World's Best Goalkeeper awards. Oliver Kahn biography shows him winning the Golden Ball after the 2002 FIFA World Cup becoming the only goalkeeper in the history of the tournament to do so. When he was only 6 years old, Oliver Kahn biography shows him joining local youth team Karlsruher SC. Kahn started playing field before he found out that his skills are a lot better as a goalkeeper. He trained and moved through the ranks of Karlsruher SC until 1987-88 season when he signed his first professional contract playing a backup keeper behind Alexander Famulla. His first team debut came on November 27th, 1987 in a 4-0 win against FC Koln. This was just a taste of playing time for Kahn because the manager Winfried Schafer preferred to have Famulla in the goalkeeper position up until 1990's. The following years Kahn established his first team place in goal becoming a leader on the team with his strong personality as well as their key player in reaching the 1993-94 UEFA Cup semi finals where they were eliminated. After great performances for Karlsruher SC, Bayern Munich showed interest in acquiring Oliver Kahn which they did at the beginning of 1994-95 season as a replacement for Raimond Aumann. Oliver Kahn biography shows that his move to Bayern cost about 4.6 million DM / €2.5 million / $3.5 million, which was also a record transfer for Goalkeeper position at that time. Biography of Oliver Kahn shows that he was named best Goalkeeper of the Year during his first season with Bayern. Right away he was established as Bayern Munich starting goalkeeper and would go on to win his first title after defeating Bordeaux in the 1996 UEFA Cup Final. His first League Championship with Bayern Munich came in 1996-97 season. Kahn was also named Goalkeeper of the Year this season for the second time in his career. I think that 1999 Champions League Final against Manchester United is worth mentioning in this Oliver Kahn Biography as it was the biggest and most surprising loss for Bayern in the history of soccer I think. Bayern Munich had an early lead 1-0 and held on to it until stoppage time. Anyone watching this game witnessed that anything can happen in the game of soccer. Bayern Munich lost the match in the last 3 minutes of the stoppage time when Teddy Sheringham and Ole Gunnar Solskjaer shook the net twice just minutes before the referee ended the game to steal the 1999 UEFA Champions League title from Bayern Munich and Oliver Kahn. His first Champions League Title with Bayern Munich came after beating Valencia in the final game of 2001 UEFA Champions League. Kahn was the key player with his 3 saves after the game ended 1-1 and went to penalties. After the match Kahn received the UEFA Fair Play Award. He walked up to Valencia goalkeeper Santiago Canizares and attempted to comfort him. This same year Kahn won the International Cupat Tokyo's National Stadium beating Argentine team Boca Juniors in the final. Oliver Kahn biography shows a rapid decline during the 2002-03 season with Kahn being at the end of some harsh criticism from the media for letting in some of the easiest goals. As of 2011, Oliver Kahn biography shows that he is the all time clean sheet leader in the history of Bundesliga, with 197 matches played without conceding a goal. His last match played in European Competition was against Zenit Saint Petersburg in the UEFA Cup semi-final on May 1st, 2008. His last Bundesliga match was on May 17th, 2008 in a 4-1 victory against Hertha Berlin. After 14 years with Bayern Munich Oliver Kahn biography as a professional soccer player comes to an end in a farewell match against Germany XI on September 2nd, 2008. Oliver Kahn biography shows that he was called up for the 1994 FIFA World Cup as a back up goalkeeper but would not get a chance to play until June 23th, 1995 when he made his international debut for Germany in a 2-1 win against Switzerland. He was the reserve goalkeeper when Germany won the 1996 UEFA European Football Championship in England. 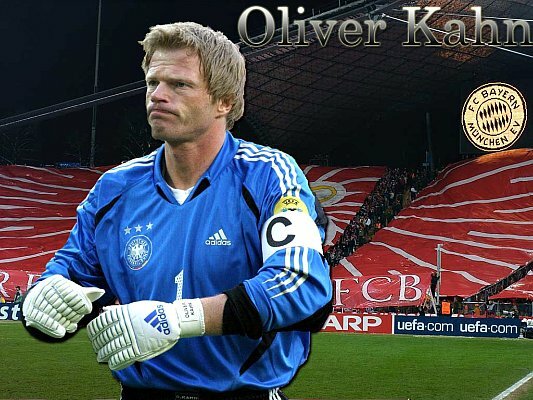 History of Oliver Kahn international career shows that he would also be on the bench as a reserve goalkeeper to great German goalie Andreas Kopke during the 1998 FIFA World Cup. After the 1998 FIFA World Cup, Andreas Kopke announced his retirement from international soccer making room for Oliver Kahn to become Germany's first choice in goal. Oliver Kahn biography shows that he became the captain of the German squad in 2002. Kahn had one of his worst international performances during the qualifying rounds of 2002 FIFA World Cup when Germany lost 5-1 against England. This loss cost Germany a direct qualifying place in the 2002 FIFA World Cup but they would secure their spot in the World Cup after beating Ukraine in the playoff. Oliver Kahn led Germany to the 2002 FIFA World Cup and although Germany had low expectations for this tournament, they managed to advance all the way to the finals. Kahn came into the final match against Brazil with a torn ligament in his right ring finger and fumbled a weak shot from Rivaldo allowing an easy tap in for Brazilian Ronaldo. Germany lost the final match 2-0 however later on in the interviews Kahn refused to blame his injury for his fumble and his gift of a goal to Ronaldo. After the tournament was over, Oliver Kahn received the Lev Yashin Award for the best goalkeeper of the tournament conceding only 3 goals, 2 of them in the final match against Brazil. Oliver Kahn bio shows that he was the first goalkeeper in the history of this competition to also win the Golden Ball for best individual performance after the 2002 FIFA World Cup was over. Oliver Kahn remained the first choice for Germany during the 2004 UEFA European Football Championship but Germany could not get past the group stage. After the 2004 UEFA European Championship, Kahn gave up his captaincy to Michael Ballack. Oliver Kahn biography shows that he lost his number one spot to his longtime competitor Jens Lehmann of Arsenal during the 2006 World Cup. He still stayed on as a backup keeper for Germany offering full support to his teammate Jens Lehmann. After getting beaten by Italy during the semi final stage of the tournament, Kahn was given the start for the 3th place against Portugal which Germany won 3-1, he was also the Germany captain after Ballack picked up an injury and could not play. After this match, Oliver Kahn bio for German National Team comes to an end as he announced his retirement from International soccer. Kahn made 86 appearances for Germany, including 49 as team captain. He never won the World Cup title but did finish 2nd in 2002 and 3th in 2006.